Anthony grew up in Olney, a small town in Southeastern Illinois. He spent much of his youth roaming around outside with a fascination for the outdoors and the power of Mother Nature to sculpt the environment. His fascination with Nature and our many environments led him into the study of Geology where he earned both a Bachelor�s and a Master�s Degree. Through his education in geology, Anthony was able to remain outdoors while gaining a much deeper appreciation and understanding for all elements involved in the shaping of our landscapes. When Anthony is looking through the lens to compose his next shot, whether it is in the flat farmlands of Illinois or in the mountain ranges of Alaska, there is always the underlying knowledge of how that scene came to be there. Humans have only been around for approximately 10,000 years, but the earth has been moving, building, and destroying continents and oceans for billions of years. It is with this passion and understanding of our world that Anthony strives to freeze stunning moments in time or place. Anthony�s driving passion is to create the most stunning images possible, bar none. His equipment, be it cameras, lenses, printers, software, frames, etc. have all been carefully selected for their abilities to make this possible. His vision for his work is to capture a place or moment of stunning beauty... a place where we can experience direct contact with Nature, or a moment that makes us forget about the everyday pressures of our busy lives. Anthony is always traveling, whether it is locally or abroad, with his camera close at hand to try to preserve a fleeting moment in a place that makes him stop and pause. The quality of Anthony�s work is the result of two factors: hard work and natural abilities. Given his meticulous nature, he always had a personal attraction to creative endeavors requiring attention to detail. When he picked up a camera for the first time, combining both creative and technical aspects, it ignited something within him. Through endless hard work and study, this natural ability and fascination with photography transformed his images into the artwork he now creates. Anthony currently resides in Olney, Illinois where he works out of White Squirrel Studio, his own state-of-the art print studio and gallery. 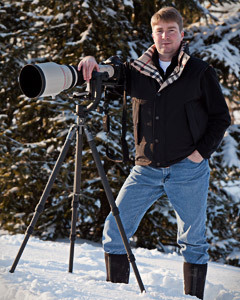 Anthony�s work has been recognized and published at an international level with such names as the prestigious BBC Wildlife, Field and Stream, and Nature Photographer�s Magazine Online, and many others. He is continually invited to enter some of the most prestigious photographic competitions in the world. It is a very great compliment to Anthony as an artist when one likes his work well enough to display it in their home or give as a gift to another. That is why so much time and effort is spent with every print, to ensure the compliment you gave him will last for generations. Think about the pride and enjoyment you would get every time you looked at one of these stunning images and showed it to guests in your home. Which one of his photographs is your favorite? Which could you see displayed in your home or office? They are committed to reversing the degradation of our planet's natural environment and to building a future in which human needs are met in harmony with nature..
Anthony is a proud supporter and member of NANPA, the North American Nature Photography Association, the first and premiere association in North America committed solely to serving the field of nature photography. NANPA fosters excellence and ethical conduct in all aspects of their endeavors.